Fentanyl addiction can lead to serious and sometimes life-threatening physical and emotional consequences. Quitting can help to stop and reverse those effects, as well as increase overall health and well-being. Improve relationships. People who are addicted to fentanyl become preoccupied with using the drug and spend less time with loved ones. Quitting allows the person to repair any damage done to relationships and resume spending quality time with significant others, friends, and family. Save money. A fentanyl habit can quickly become expensive. Users build tolerance and must maintain a steady supply of the drug to avoid getting sick from withdrawal symptoms. Avoid legal problems. Some users resort to crime to support their habit and put themselves in physical danger or in confrontations with the law. Your treatment needs will vary depending on the severity of your fentanyl addiction, length of use, and overall physical and mental wellbeing. Medical supervision is recommended for anyone trying to quit opioids. Quitting on your own can be difficult and risky, as the severely unpleasant withdrawal symptoms are often overwhelming and may increase the likelihood of relapse. A healthcare provider can help to minimize any withdrawal symptoms as well as ensure you have the right level of care based on your individual needs. Inpatient treatment – Many inpatient or residential programs offer medically supervised detox combined with individual and group therapy. Participants live at the facility for the duration of treatment, which can last from 28 days to 90 days or longer. These programs also offer medical care, should it be needed, and may treat co-occurring mental health conditions. Outpatient treatment – Outpatient treatment is offered on a part-time basis and can include individual and group counseling. This type of treatment allows you to still reside in your community during treatment. Outpatient substance abuse treatment programs are good options for people who have less severe forms of addiction and a good support system, or people who are transitioning out of inpatient care. 12-step programs – Twelve-step programs, such as Narcotics Anonymous (NA), offer peer support and a program of recovery that people complete with the help of a sponsor. These programs are abstinence-only and emphasize powerlessness over addiction. Non-12-step programs, such as SMART Recovery, are also available for people who seek alternatives to the NA model. Aftercare is treatment or support that takes place after a person leaves a formal treatment program. Many people struggle once they return to their day-to-day lives, and relapse rates are high. Some form of aftercare helps the person get support for issues that come up in recovery, as well as a community of people to reach out to if the person believes he or she is in danger of relapsing. One-on-one therapy with a licensed therapist or social worker. Other support groups, either in person or online. Sober living arrangements or drug-free housing. Someone who has become physically dependent on fentanyl – either through addiction or from regularly using the drug as prescribed – will experience withdrawal symptoms when he or she stops using the drug or lowers his or her dose. Muscle spasms (sometimes referred to as “kicking”). Gastrointestinal distress – nausea, vomiting, abdominal cramps, diarrhea. How Long Do Withdrawal Symptoms Last? Fentanyl users will usually begin to experience withdrawal symptoms about 3 to 5 hours after their last use. The most intense symptoms usually occur within 8 to 12 hours. The symptoms should subside within 4 to 5 days if the person was not using any other drugs. If the person was combining fentanyl with heroin, withdrawal will last longer – possibly 7 to 10 days. Medication-assisted treatment (MAT), sometimes called medication-assisted therapy, is commonly used to help users withdraw from opioid drugs such as fentanyl. The physician will prescribe an opioid replacement medication and then gradually reduce the dose over a period of time or keep the user on a maintenance dose. MAT combines pharmaceutical intervention with counseling and/or behavioral therapies. MAT should only be conducted under the supervision of a physician. Methadone – a long-acting opioid agonist that can help treat withdrawal symptoms and cravings. Methadone can only be prescribed at clinics regulated by the Substance Abuse and Mental Health Services Administration (SAMHSA), and users must travel to the clinic to obtain it. Buprenorphine – a partial opioid agonist that can also help reduce withdrawal symptoms and cravings. Suboxone, a combination of buprenorphine and naloxone, is also available. Buprenorphine can be prescribed by physicians who are certified by SAMHSA, but SAMHSA has placed patient limits on these physicians. Naltrexone – an opioid antagonist that blocks the effects of other opioids such as fentanyl without producing euphoria. Try to understand why you became addicted. 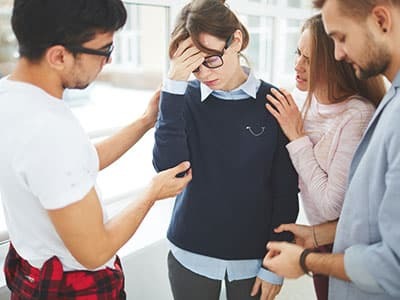 Work with a therapist to uncover the reasons why you started abusing fentanyl, and get treatment for any co-occurring mental health conditions, such as depression, anxiety, or post-traumatic stress disorder. Getting treatment for these issues will help prevent relapse. Get professional help. Quitting on your own is very difficult, and many people relapse. Find a treatment facility that offers detox and therapy, or attend a 12-step or non-12-step meeting. Surround yourself with people who do not use drugs. This can include family, friends, or other people in recovery. Take care of yourself. The better you feel, the less likely you will be to relapse. Get enough sleep, eat a healthy diet, and find some form of exercise that you enjoy. Identify your triggers. These are people, places, or things that make you want to use drugs. Work with a therapist, friend, or family member to develop a list of your triggers and how you can avoid them or cope with them when they are unavoidable. Stay positive and take it one day at a time. Recovery takes time, and it isn’t always a smooth path. If you relapse, don’t beat yourself up. It’s a normal part of the recovery process. Keep a list of motivational quotes to help keep you going, and rely on your support system when times get tough. Approach the person when he or she is sober. Speak to the person from a place of compassion and concern. Wait until you are calm and composed. Prepare a list of treatment options that you can present to the person if he or she shows interest in getting help. Expect that the person may deny there is a problem and be prepared to try again another time. Point to specific incidents where the person’s addiction affected you or another family member. Express concern for the person’s wellbeing. Accept that it is ultimately up the person whether he or she wants to get help. Blame the person for his or her addiction. Demand that he or she get help. Enable the person by giving him or her money, allowing drug use in the home, or covering for him or her. Pretend that nothing is wrong if there is clearly a problem. People often relapse to relieve the withdrawal symptoms. Overdose. People who detox from fentanyl lower their tolerance to the drug and can overdose and die if they resume fentanyl use at their normal dose. Cravings and relapse Withdrawal symptoms are extremely uncomfortable and are often accompanied by cravings to use the drug to relieve the symptoms. Medical complications. Fentanyl withdrawal can be accompanied by vomiting and diarrhea, which can lead to dehydration and electrolyte imbalance. Mental health problems. Some users become depressed during withdrawal and may have thoughts of self-harm. Medically supervised detox in a detox center or inpatient recovery program can help to ensure safety, increase comfort, and provide a solid start to the recovery process. If you need help finding a recovery program for quitting fentanyl, call 1-888-319-2606 Who Answers? . Treatment support representatives are standing by to take your call 24 hours a day, 7 days a week. They can answer any questions about payment or insurance and offer you options based on your situation.
. Substance Abuse and Mental Health Services Administration (SAMHSA). (2006). Quick Guide for Clinicians: Detoxification and Substance Abuse Treatment.
. Drug Enforcement Administration (DEA). (2015). Fentanyl.